Last year, U.S. 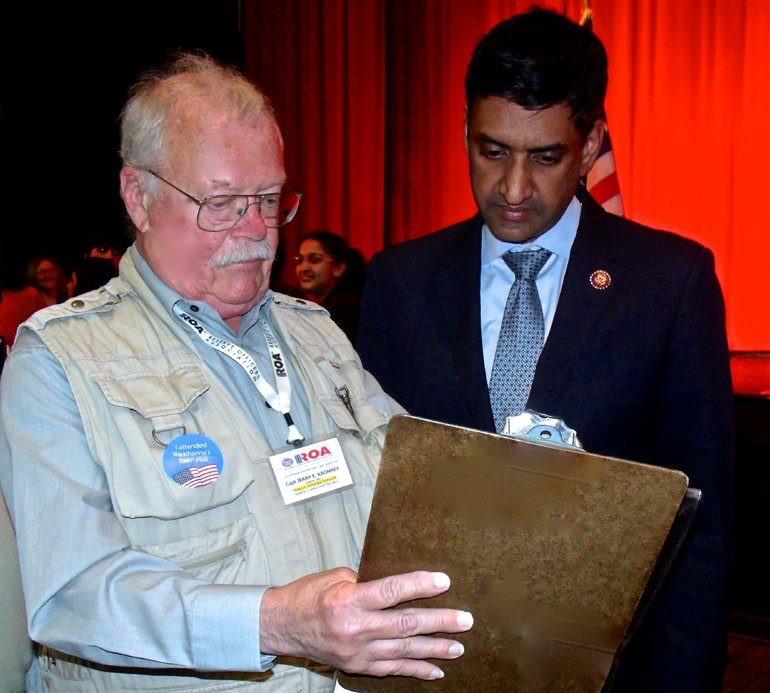 Congressman Ro Khanna (CA-17), and Mr. Tom Pyke, his Constituent Services Director, heard four briefings about “Medical Claims without Medical Records.” The event was sponsored by the ROA Department of the Golden West Santa Clara County Unified Chapter GW/063. The Department is working with the Congressman’s office on two ROA Resolutions. It is hoped the two ROA Resolutions will soon become the language in Federal Law. When an active-duty U.S. Navy officer retired after 20 years, her retirement check arrived as expected, about 30 days after her retirement date. Holding the bag, that is. It’s a bag too often empty because of balky technology and outdated processes that affect members of the Reserve and National Guard — and wouldn’t be tolerated for active-duty troops. Thanksgiving is a great door for us in America as it can open for us a time of thanks and expectancy. With Thanksgiving as a designated day behind us, we now look forward with hope and expectancy in celebrating our Judeo-Christian roots. The Jewish event of Hanukkah, celebrated this month, looks back to a miraculous time in history (nearly two hundred years B.C.). During the rededication of the Jewish Temple of Worship, oil for the temple lamp (enough for only one day) remained lit for the eight days needed to press and dedicate more oil for the duration. The birth of Jesus, celebrated this month as well, introduced the Christian Era. Whether Jewish or Christian, this special season is marked by God visiting His people and bringing about miracles. The study of the entire Holy Scriptures begins and ends with God desiring to enter into the lives of people who seek Him as the Living God interested in His creation. It was, and is, His choice to be with us and to enter into our world. The celebration and worship brought forth with harp, orchestra, and vocal proclamations. Young children become fascinated, with eyes and ears wide open, listening to stories read and events proclaimed, of God’s entrance and actions. Adults look back, remember, recall, return and reflect pondering the best way to share what they now know with the children and grandchildren. Today, we celebrate and proclaim God is with us in our history, our present and our future personal lives. Yes, it is true there is a materialistic connection to modern day Christmas and Hanukkah, but we also thrive in the true meaning of this special season. Truth and Life came from the portals of heaven to the mud, dirt, dust, pain, suffering and sin of this world just for you and me. God’s goal is restoration and not retribution for His creation. The materialism, without the spiritual, can have a celebration of such which leads to tiredness, busyness, festive and even some reflective depression and stressful moments. While our Judeo-Christian roots are very deep as well as very personal, they cannot just be casual nor superficial. I cannot treat God’s visitation lightly for the results of doing so not only affect me but the society in which I live. Faith or lack thereof has a definite impact not only on my present but my future as well. From Moses and Prophets to St. John the Revelator the march and echo is “Peace on earth with good will toward men.” Just as God “reached out of Himself” to impact my life, I am not content until I reach out to Him and then outside myself to my neighbor.